Butcher's broom (Ruscus aculeatus) is an herb sourced from a small evergreen shrub found in Europe and North Africa. The root of the plant is used to make the supplement. In some areas of the world, these roots are eaten like asparagus. Butcher's broom is also commonly used for the possible health benefits that it provides. Chronic venous insufficiency is a condition in which the veins do not efficiently return blood from the legs to the heart, resulting in blood "pooling" in leg veins. The condition results from partial vein blockage or blood leakage around the valves of the veins and can be treated with compression stockings, lifestyle changes (such as avoiding long periods of sitting or standing), and/or surgery. Butcher's broom is rich in flavonoids, antioxidants that strengthen blood vessels and reduce the fragility of capillaries. The herb contains substances that appears to stimulate receptors in the body known as "alpha-adrenergic receptors," which cause veins to constrict. Although research on the use of butcher's broom alone is very limited, some studies have examined butcher's broom as a key ingredient in a formulation combined with hesperidin and ascorbic acid (a form of vitamin C). In a 2017 study published in International Angiology, for example, researchers analyzed 10 previously published studies on the use of Ruscus extract in people with chronic venous disorders. The study's authors found that Ruscus reduced leg pain, heaviness, feeling of swelling, and other symptoms compared to a placebo. A study published in the journal Arzneimittel-Forschung concluded that butcher's broom is "a safe and effective treatment for patients suffering from chronic venous insufficiency." For the study, 148 people with chronic venous insufficiency took either butcher's broom or a placebo every day for 12 weeks. By the study's end, those who had received butcher's broom experienced significantly greater improvements in several symptoms (such as heaviness and tiredness in the legs and sensations of tingling and tension) compared to the placebo group. The treatment group also showed greater improvement in quality of life. Butcher's broom may trigger mild side effects, such as upset stomach and diarrhea. Due to the potential alpha-adrenergic stimulating properties and tyramine content, butcher's broom may cause adverse effects such as elevated blood pressure and increased urination. Additionally, butcher's broom may interact with certain medications, such as alpha-blockers, antidepressants, monoamine oxidase inhibitors (MAOIs), blood pressure medication, diuretics, lithium, and blood-thinning drugs like warfarin. According to a case report, a woman developed diabetic ketoacidosis five days after beginning treatment with butcher's broom for mild ankle swelling. If you're considering using butcher's broom supplements, be sure to speak to your doctor first to discuss whether they are appropriate and safe for you. Self-treating chronic venous insufficiency and avoiding or delaying standard care may have serious consequences. Pregnant and breastfeeding women and children shouldn't take butcher's broom. You can get additional tips on using supplements here. There is not enough scientific data to provide a recommended dose of butcher's broom. But doses have been studied in clinical trials. For example, in a study examining butcher's broom's effect on chronic venous insufficiency, 150 mg of butcher’s broom root extract, combined with 150 mg of hesperidin and 100 mg of ascorbic acid was used twice daily. Available for purchase online, butcher's broom supplements are sold in many natural-food stores and in stores specializing in dietary supplements. You may see the raw root sold in some stores, there are also liquid butcher's broom extracts, and tablets or capsules. Sometimes, the supplements contains a combination of butcher's broom and other ingredients. If you choose to buy a supplement, the National Institutes of Health (NIH) recommends that you look for a Supplement Facts label on the product that you buy. This label will contain vital information including the amount of active ingredients per serving, and other added ingredients like fillers, binders, and flavorings. 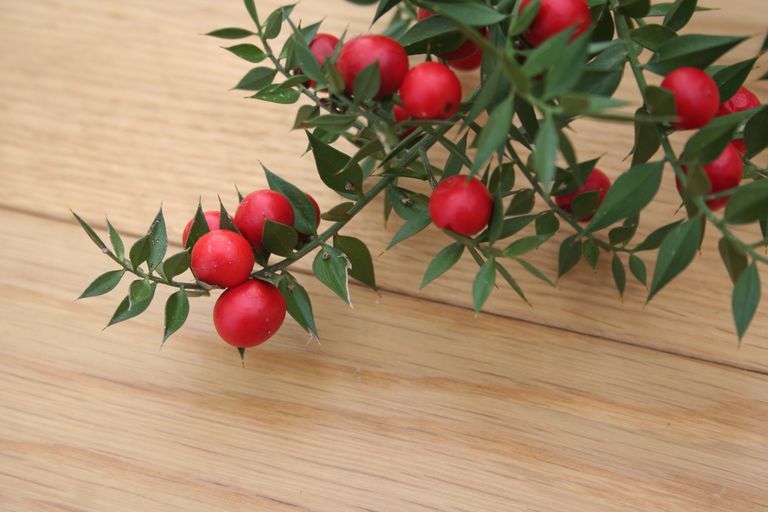 Although butcher's broom shows promise in the treatment of chronic venous insufficiency, more research needs to be conducted before it can be recommended as a treatment for this condition. If you're considering the use of butcher's broom, make sure to consult your physician before starting your supplement regimen. Kakkos SK, Allaert FA. Efficacy of Ruscus extract, HMC and vitamin C, constituents of Cyclo 3 fort®, on improving individual venous symptoms and edema: a systematic review and meta-analysis of randomized double-blind placebo-controlled trials. Int Angiol. 2017 Apr;36(2):93-106. Vanscheidt W, Jost V, Wolna P, et al. "Efficacy and safety of a Butcher's broom preparation (Ruscus aculeatus L. extract) compared to placebo in patients suffering from chronic venous insufficiency." Arzneimittelforschung. 2002;52(4):243-50. Can Grape Seed Extract Help Chronic Venous Insufficiency?